Until this year, the local (as in Swiss) strawberry season for me has been so sadly short - a few weeks somewhere around early June to early July. But this year I've been able to gorge myself on good, fresh strawberries since January. That's when the winter strawberry season starts in Japan, with berries grown under protection in the southern island of Kyushu and shipped around the country, up until around mid March. 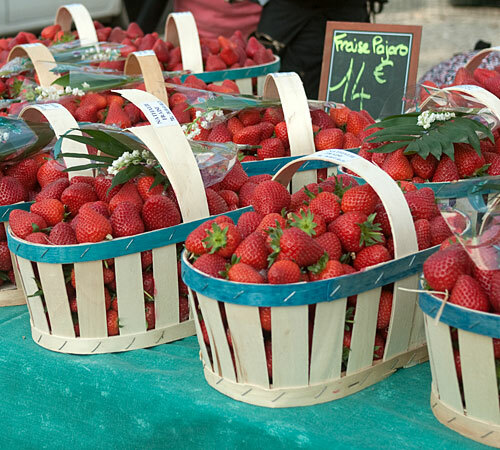 Then when I got back home it was time for the start of the strawberry season in Provence, which starts in late March and ends just around this time, in late June to early July. While the carefully cultivated Japanese strawberries are very good, to me the best of the French ones, some of which are heirloom varieties, win hands down. From the early orange-red, pointed garriguette to the small, round late season mara des bois, they have poetic names and gorgeous flavor. I love strawberries just eaten out of hand the best, but there is something about the whole process of making strawberry jam that compels me to go through the rather long process every year. You might think that there isn't much reason to make your own strawberry jam in this day and age, until you have made your own. 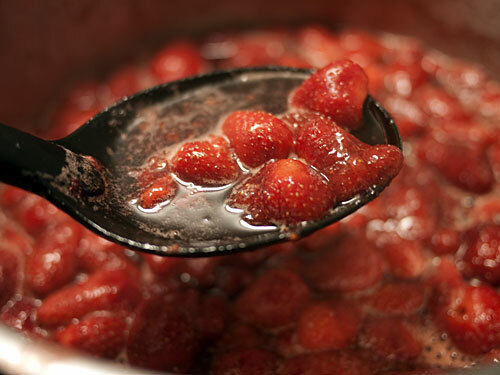 The smell of strawberries as they simmer slowly in sugar syrup, the berries turning from fruit into soft, translucent sweet jewels, is absolutely intoxicating. While I like other jams and preserves, strawberry jam is my absolute favorite. There are lots of recipes for strawberry jam out there, but this is the method I follow. The key to making the best strawberry jam possible is to select the absolutely best berries you can find and afford. Modern preserve making for most of us is not about dealing with the remains of the harvest somehow as it was for our grandmothers - it's about taking the time to make something that tastes great. All in all, this jam recipe uses just three ingredients: strawberries, pure white cane sugar (granulated is fine), and a little lemon juice. No brandy, no cognac, no pectin or whatever - what I want from strawberry jam is just strawberry and sweetness. And please don't bother asking about substitutes for the white sugar; this is a confection, not not a health food, and nor does it count as one of your 5-a-day fruit and veg servings. As I write this, the strawberry season is almost over in the northern hemisphere, but if you're lucky and have some late-season ones around, or if you're on the other side of the globe and spring is on the horizon soon, give this a try. Note that the important thing here is the proportion of strawberries to sugar. 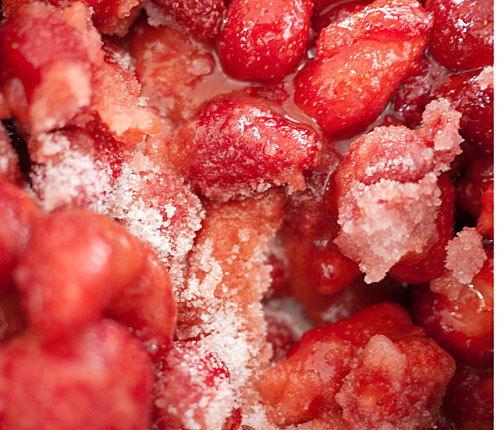 If you have more or less strawberries to work with, adjust the sugar accordingly. Here I'm going to start with 1 kilo (2 lbs 2 oz.) of strawberries- this makes about 6 to 7 cups of jam. Please do weigh your berries for the best and reliably reproduceable results. I always wash the berries by rinsing them gently in water first and then hulling them; this prevents the berries from getting water-logged. (Hulling means to pull off the little stem end bit of green and the white core that comes attached to it.) Put the hulled berries in a large, non-reactive (glass, ceramic, enameled or stainless steel) bowl. Next, weigh out your sugar. The sugar should be from .8 to 1.2 times the amount of strawberries in weight . So, if you have 1 kilo of strawberries, you need 800 grams to 1200 grams of sugar. The amount of sugar varies according to how sweet your strawberries are, and how sweet and thick you want your jam to be. The less sugar, the less sweet and thinner your jam will be. The more sugar you add, the more thick and syrupy the jam will be - and it will be sweeter too, of course. I had 1 kilo (2 lbs 2 oz) of fairly sweet berries, so I just used an easy 1:1 ratio and used 1 kilo (2 lb 2 oz) of sugar. I also used the juice of 2 lemons (1 lemon per 500 grams or about 1 pound of strawberries). Add the sugar and lemon juice to the berries, and toss gently so that the berries are coated with the sugar. Cover the bowl to protect it from critters, and leave the berries to macerate for several hours or overnight in a cool place or in the refrigerator. Put the whole thing in a large, heavy-bottomed pot - make sure that the pot is big enough to to allow for the foamy expansion that will occur. Boiled over jam is not at all nice to clean up. Bring up to a boil over high heat, stirring occasionally. It will foam up quite a bit. You can just stir down the foam if you like, but if you want the jam to be clear and jewel-like in color, skim off the foam with a spoon diligently. 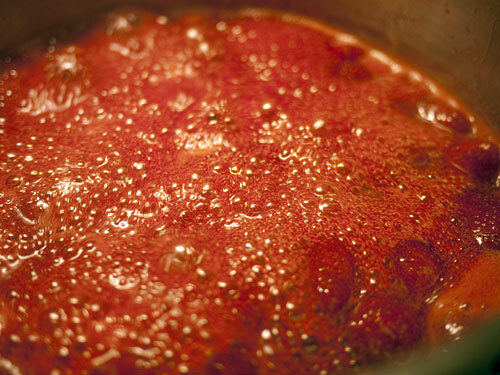 Lower the heat to about medium, so that the jam is still bubbling but not boiling over. The aim here is to cook down the syrup quite rapidly, so that it turns thick but still retains that fresh strawberry flavor. Stir up the bottom of the pot quite often to prevent the sugar from burning, and keep on skimming off the foam. When the strawberries have turned limp and soft, but still hold their shape, you have two choices as to how to proceed. One is, just leave the berries in there and continue simmering until the syrup has thickened up. If you like jam with recognizable strawberries in it though. 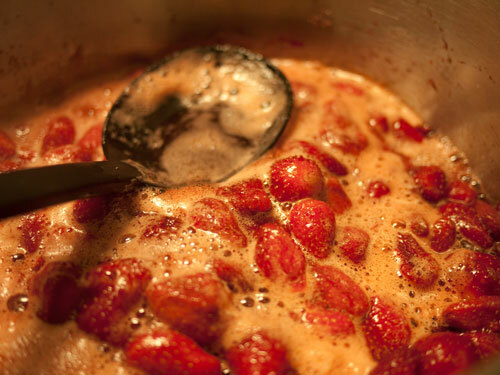 you can scoop out some of the berries, simmer down the syrup, and add the strawberries back at the end. Continue simmering down the jam until, when you take out a spoonful of the syrup and put it on a cold clean plate, it stiffens up and forms a slight skin on top instead of running all over the plate. 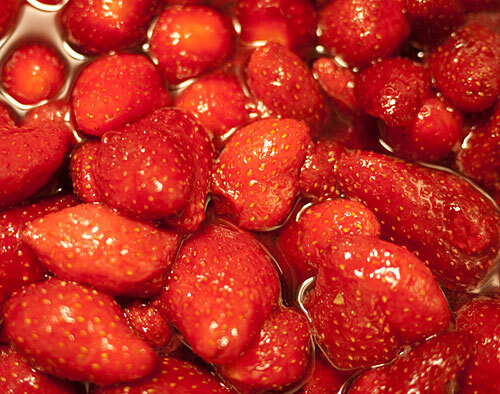 Take the pot off the heat and re-add your whole strawberries back if you took them out before. You can then pack up the jam in sterilized jam jars if you wish. Follow the instructions I gave here, or your favorite canning method. Or, you can just keep the jam in an airtight container in the refrigerator if you don't want to bother with all that sterilizing and such. 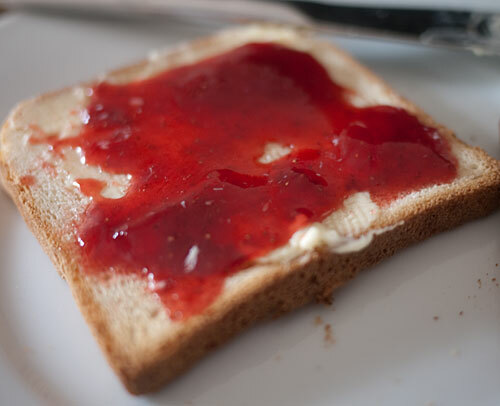 There are so many ways to enjoy strawberry jam, but I my favorite is to just spread it on warm, buttered toast. Sorry about the crumbs in the jam, I was in a hurry. Submitted by maki on 2010-06-29 03:01. I love making jam - and my recipe uses the same simple ingredients! I make it every year too - just so I have my favorites on hand. (It's hard to find plum jam here - but we get plums. So I make that and strawberry. Sometimes nectarine too.) I put the cooked jam into freezer jars and keep it until needed. Wow, that looks amazingly delicious! I'll have to try to make it sometime. 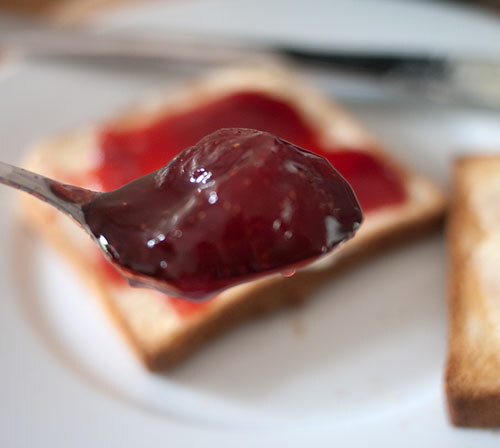 Even though jelly goes with peanut butter, I still enjoy jam better with it. My Grandmother has made strawberry jam every year from plants she's kept with her since my mother was just a twinkle. They are tiny, but so sweet my Grandmother only puts a table spoon or two of sugar in the entire batch of jam. Which is probably why my first attempt at making strawberry jam was so... interesting. I'm super excited to have found your site and that you've shared a jam recipe that doesn't involve waiting for Jam season to get the right kinds of gelatin's and such like my Grandmothers does. Never thought of adding lemon juice though. Thanks for the very detailed recipe. I've made other jams before, though never strawberry, and I've always used pectin. I'll have to give this a try. Looks superdelicious! I've never made jam before, I want to try this one out. I am going to try and make jam with your recipe as soon as I can get some good berries. 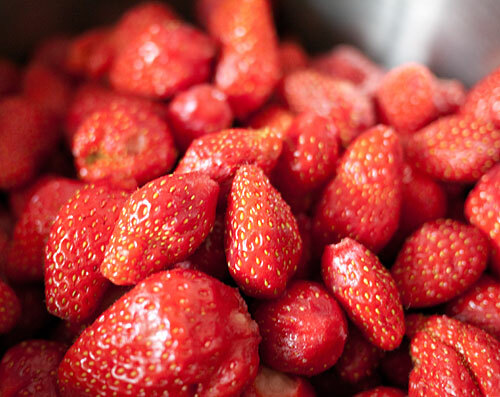 Here in Norway the strawberry season has just barely begun, but I am waiting eagerly for the tiny, bright red, sweet and wonderfully tasting strawberries that I think have no match in the whole world. It is the slow growth and low temperature that makes the berries so tasty, yum. Love your beautiful pictures. They're making me hungry! Most jams can be frozen successfully, though usually keeping it in the refrigerator is enough if you don't want to go the canning route. Low-sugar jams and preserves should be frozen though, since they can spoil fairly fast. Those look amazing! I never knew it was that simple to make jam. Maybe I'll plan my next trip to England to coincide with strawberry season and take advantage of my sister's kitchen! First of all, THANK YOU for providing directions with weights instead of volumes for the berries. 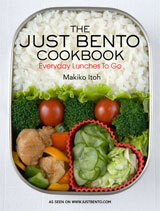 I have such a hard time finding recipes like that in the U.S., even from canning professionals. It's just not how it has been done here historically and that drives me bonkers. I am a scientist and overthinker. Secondly, a warning to others that a large batch takes a L-O-N-G time to cook down. I expected that but not *how* long. Four pounds each of berries and sugar took well over an hour to get jammy. That's a lot of stirring! Lastly, my tweaks: I let the berries macerate in sugar in the fridge for 3 days. Tossed them together and just couldn't get around to jamming until then. Also, I tossed in some chopped candied jalapeños* during maceration for a spicy kick. Adding jalapenos sounds like a great idea!